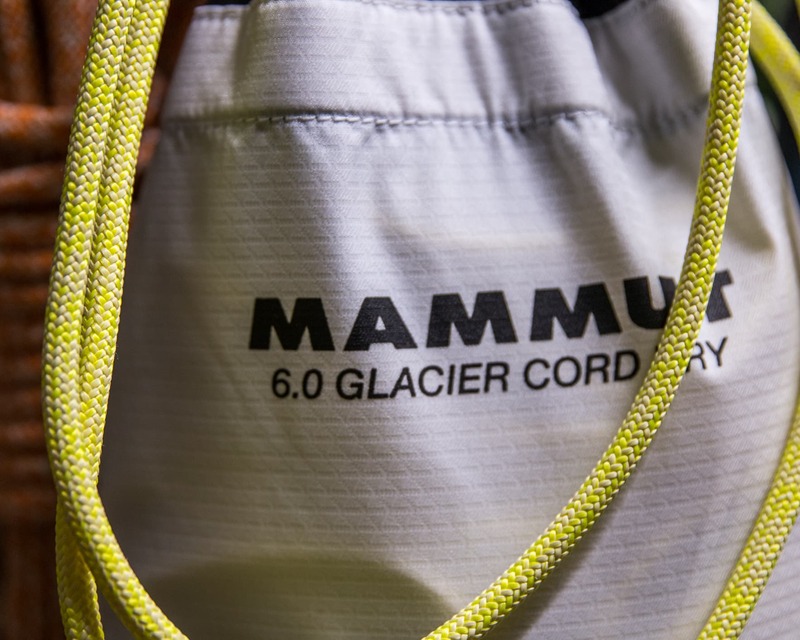 Much like Petzl’s Rad line, Mammut’s new Glacier Cord is a high-strength, low-stretch glacier travel and crevasse rescue cord. The sheath is woven from a grippy combination of aramid and polyester over a Dyneema core. 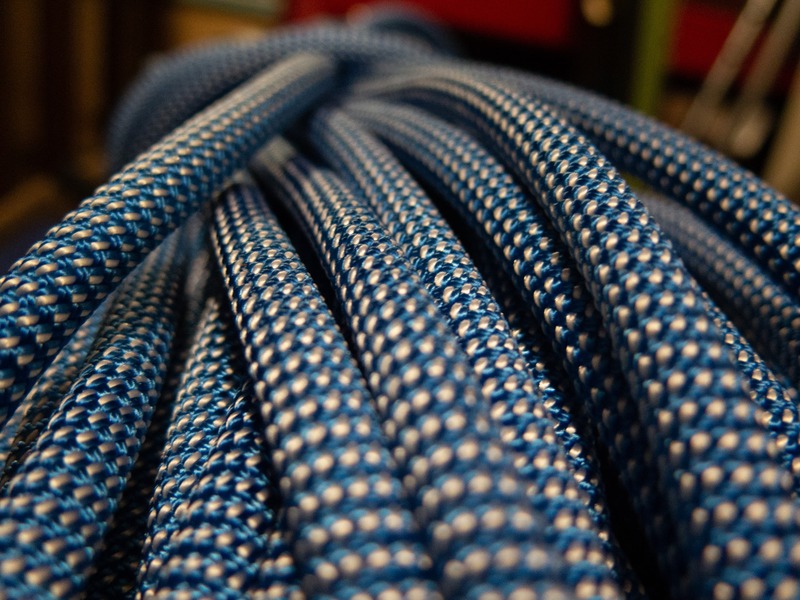 Weighing in at 25g/m this 6mm cord is both compact and lightweight but surprisingly strong with a breaking strength of 14 kN. 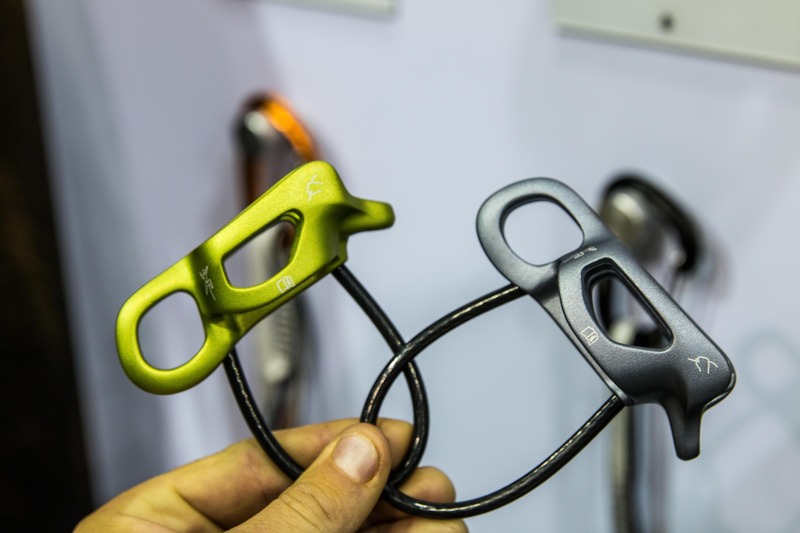 It’s been certified for use with Petzl’s Tibloc and Micro-Tracion, devices that are typically only good for ropes 8mm+ in diameter. 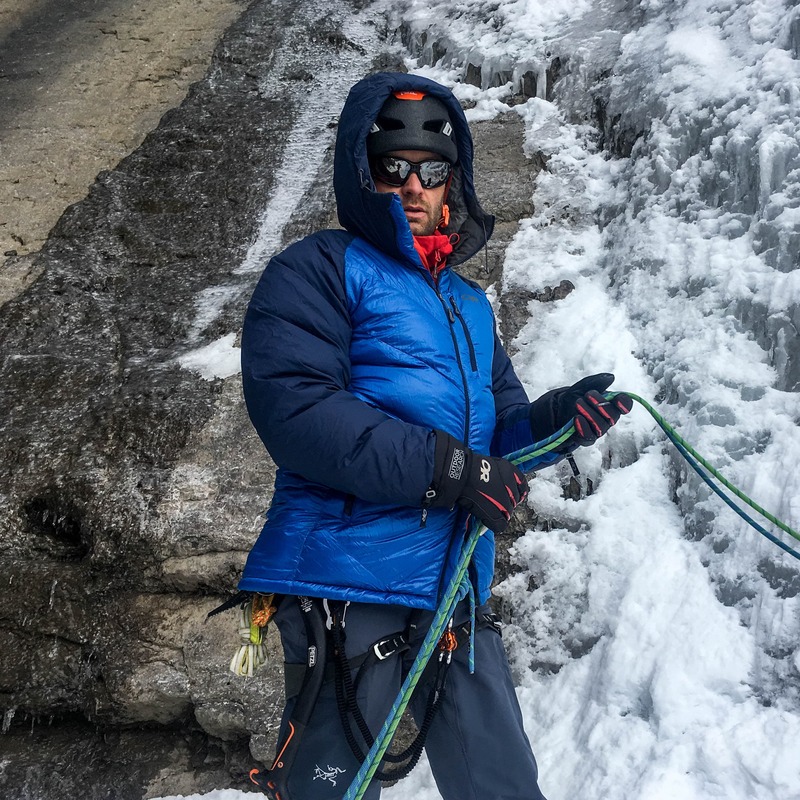 Unlike the competition, Mammut has given the Glacier Cord a Dry treatment to reduce water absorption and improve abrasion resistance. The cord will come in 30m and 60m lengths but of course it isn’t cheap. 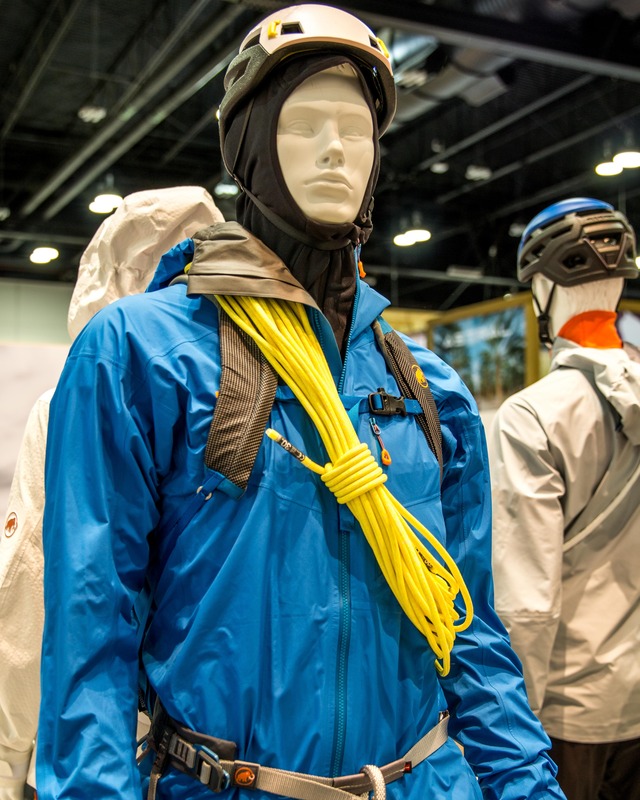 Nothing made with Dyneema ever is! The MSRP for the 30m line is $250 USD while the 60m line is $460 USD. On the upside they come with a small stuff sac to carry the rope in. A fantastic, but very specialist product. 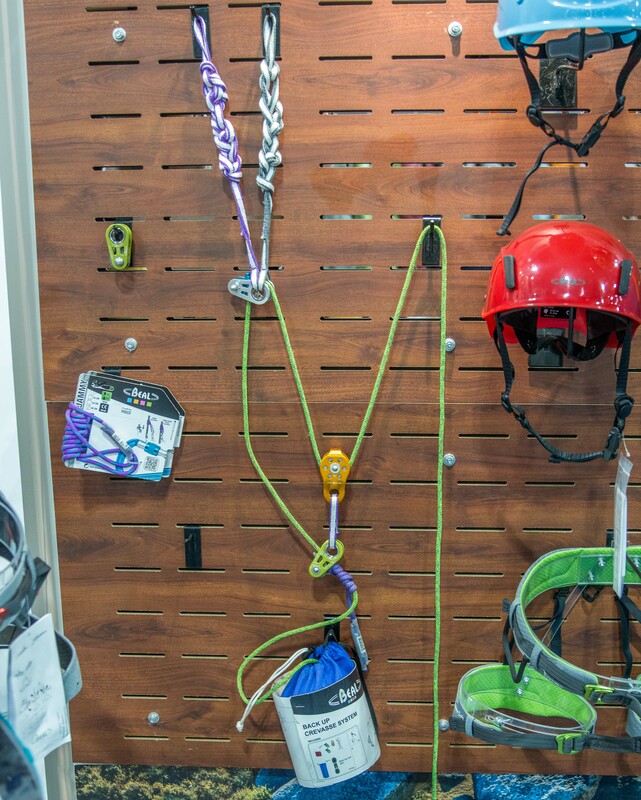 Built on Beal’s 5mm Back-Up Line this new Crevasse Rescue Kit is a pre-rigged hauling system that can be used to pull someone from a crevasse. I must admit that the thought of hauling someone on a single strand of 5mm cord makes me a little nervous. It has a rated breaking strength of 10 kN though…strong enough so long as the system isn’t shock loaded. 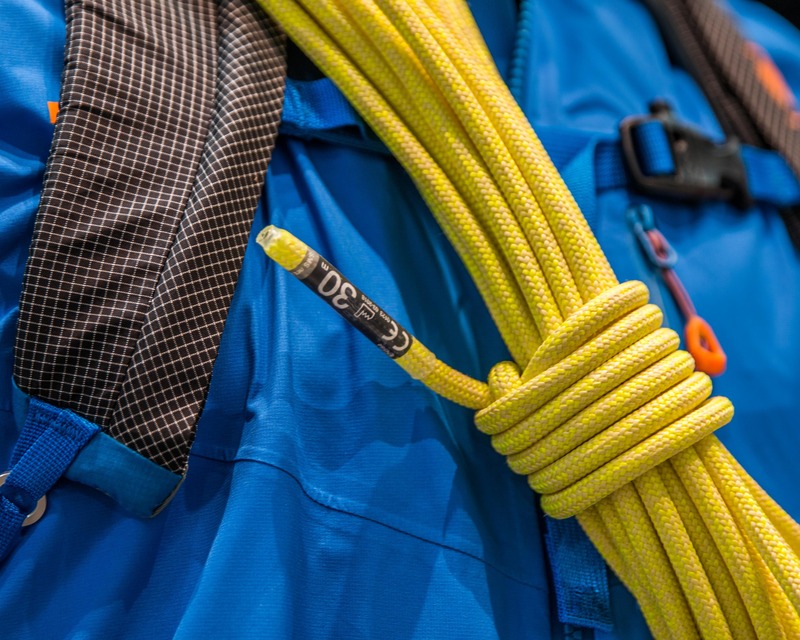 Of course it’s not meant to be used as a glacier travel rope like the 6mm Dyneema rope system discussed above though. The kit weighs in at 1087g with all the above kit and packs into a very small and portable package. The MSRP for the entire kit is $350 USD. 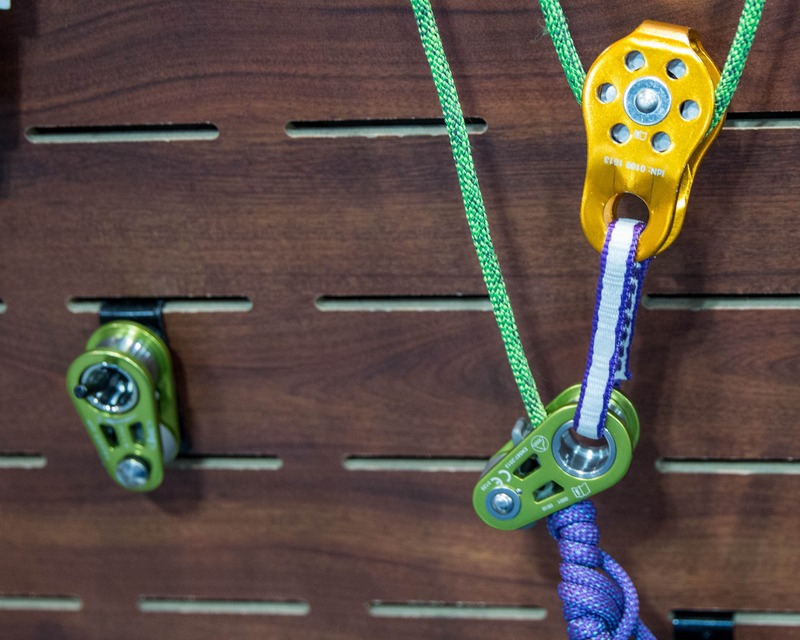 Much less expensive than the Petzl or Mammut options but also more limited in application. I’m definitely going to be looking into this product further and will have a review out sometime this winter. 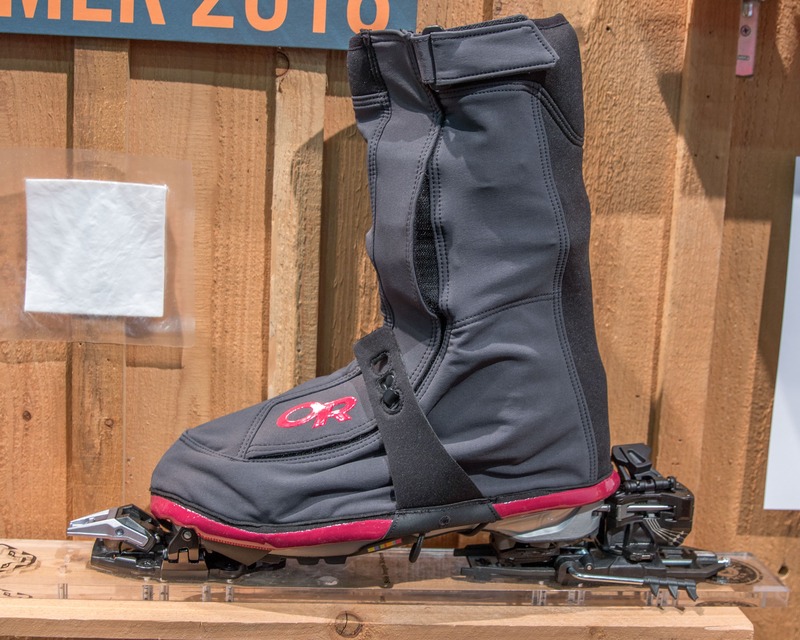 Now while OR is calling this a gaiter it’s really more of an over-boot in my mind. 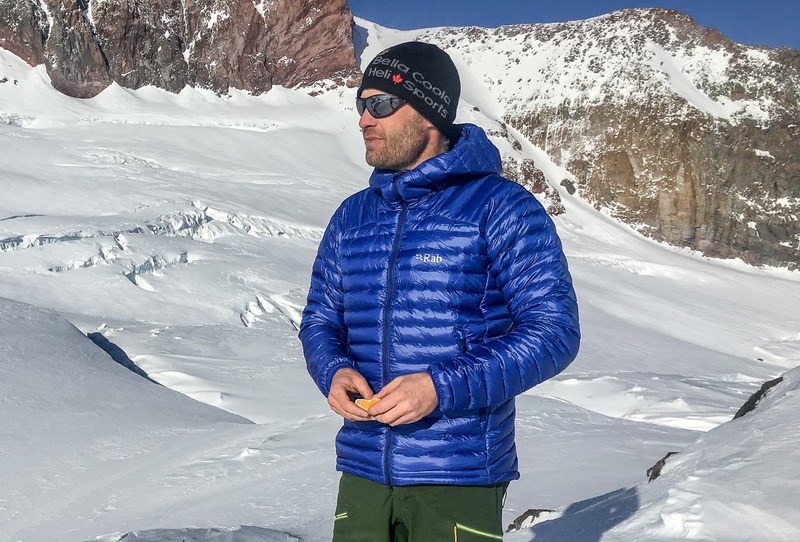 It’s basically designed to increase the warmth of mountaineering or ski touring boots for cold weather or high elevation climbing. With the high top Velcro closure it’ll double as a gaiter though. 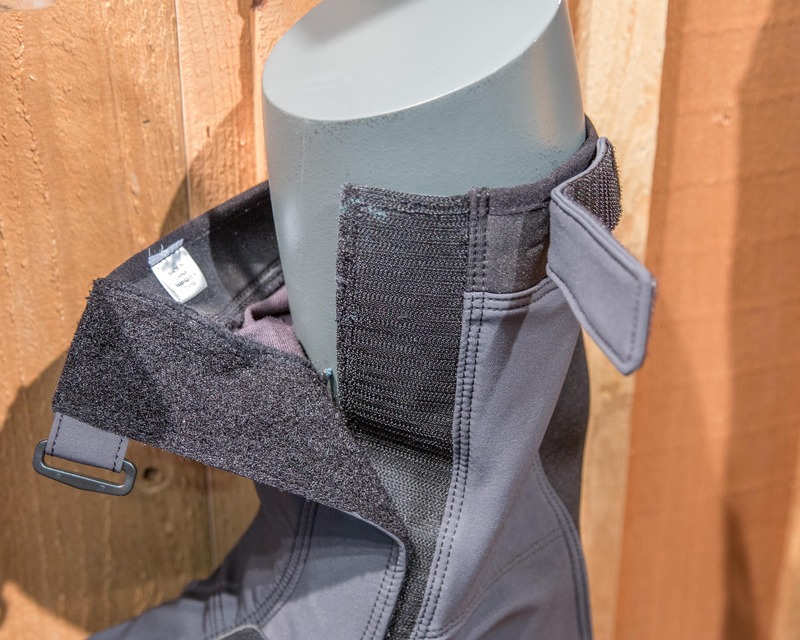 OR utilized Primaloft’s new and incredibly warm Aerogel insulation in the X-Gaiter. Originally developed by NASA to insulate space suits this lightweight and efficient insulation doesn’t compress like traditional insulation. A great option for this type of use. 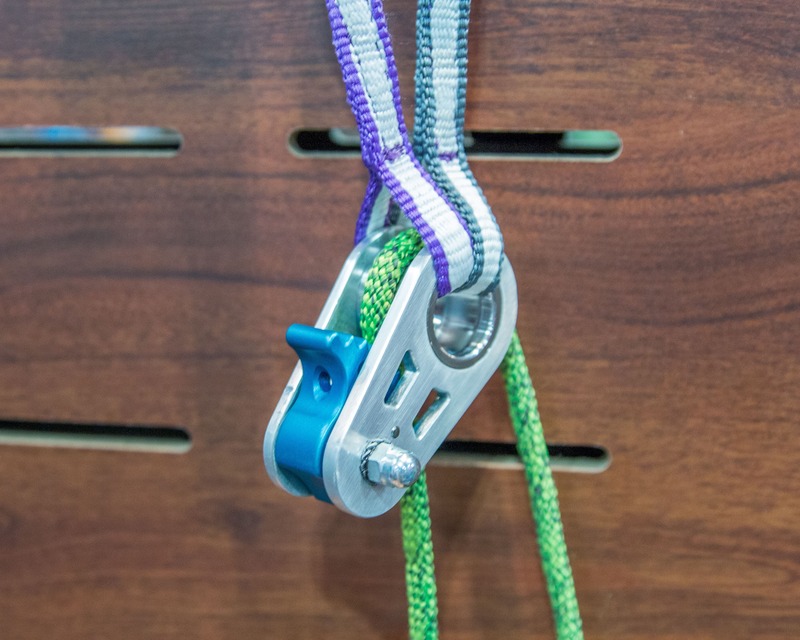 Other features include an easy-to-use hook and loop closures and an x-shaped underfoot shock-cord adjustment system. 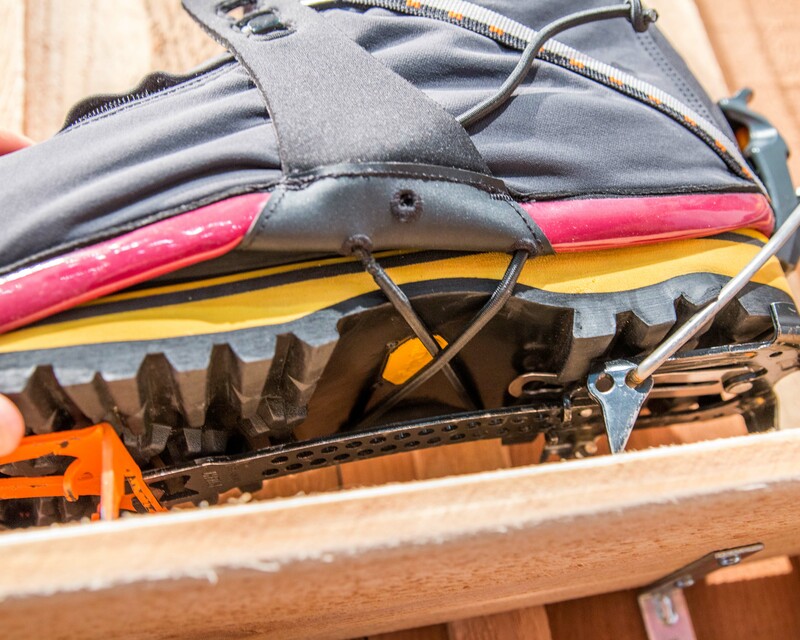 The X-Gaiters are compatible with a wide range of boot types including mountaineering and ski touring boots. 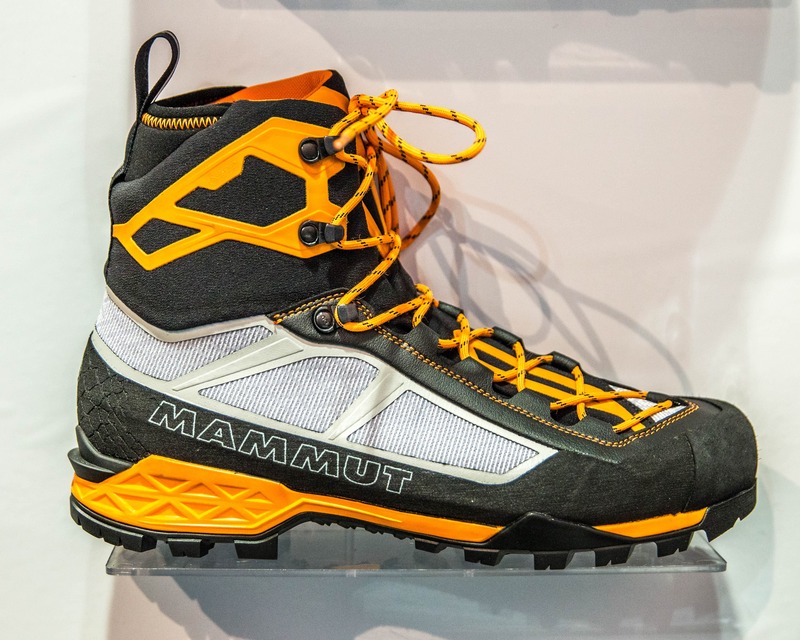 They’re also wearable with crampons and tech bindings. They weigh 475g per pair, will be available in sizes from XS to XL and retail for $245 USD. 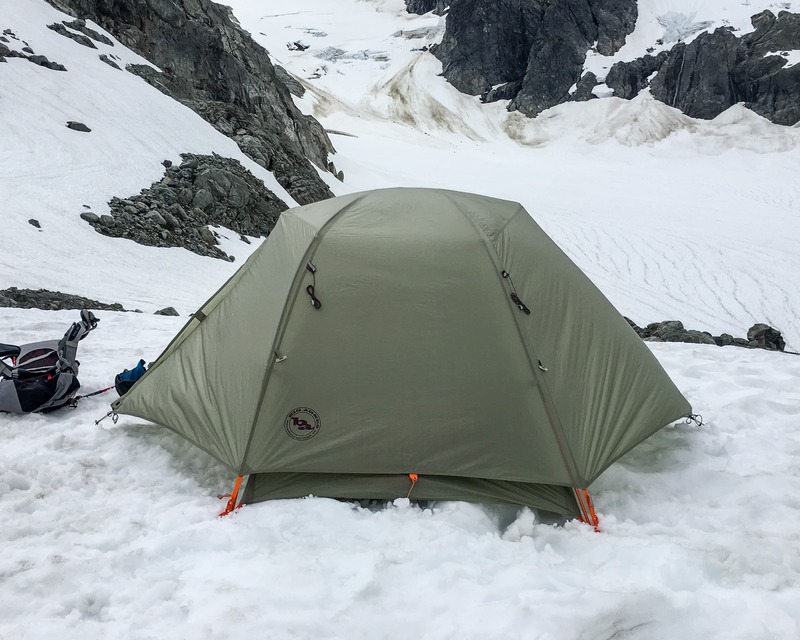 Please excuse the poorly fitted crampons in the photo, the guys at the booth must have been a little rushed. 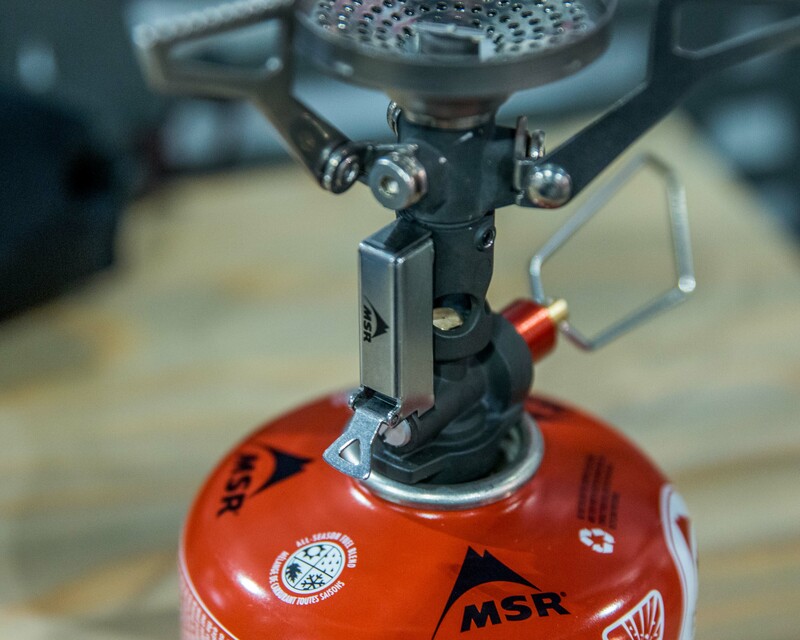 MSR is adding to the Pocket Rocket line with the introduction of the Deluxe model. The name’s almost an oxymoron given the minimalist nature of the Pocket Rocket though. A Plus version would be more descriptive. Naming aside, it’s basically the same Pocket Rocket but with the addition of a pressure regulator, piezo igniter and a larger burner. 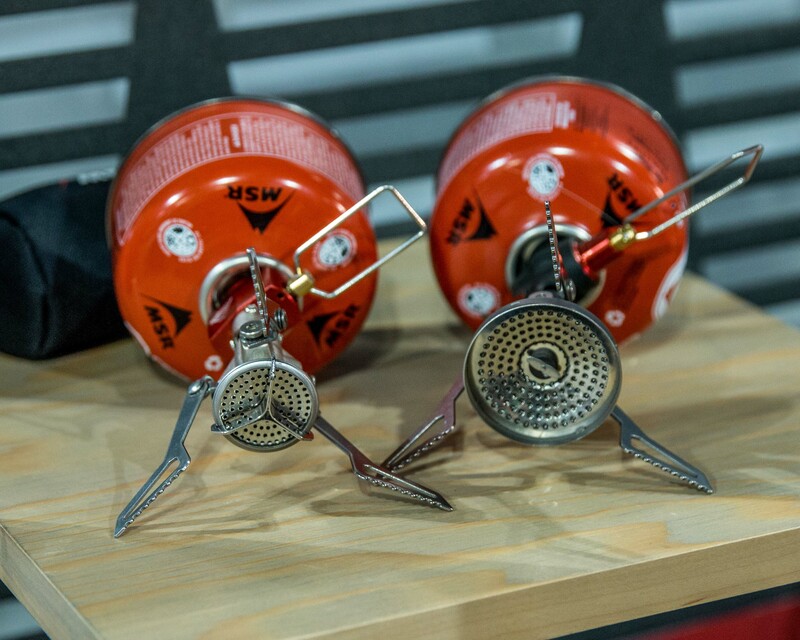 The pressure regulator will make the stove more efficient in cold weather and with low fuel canisters. 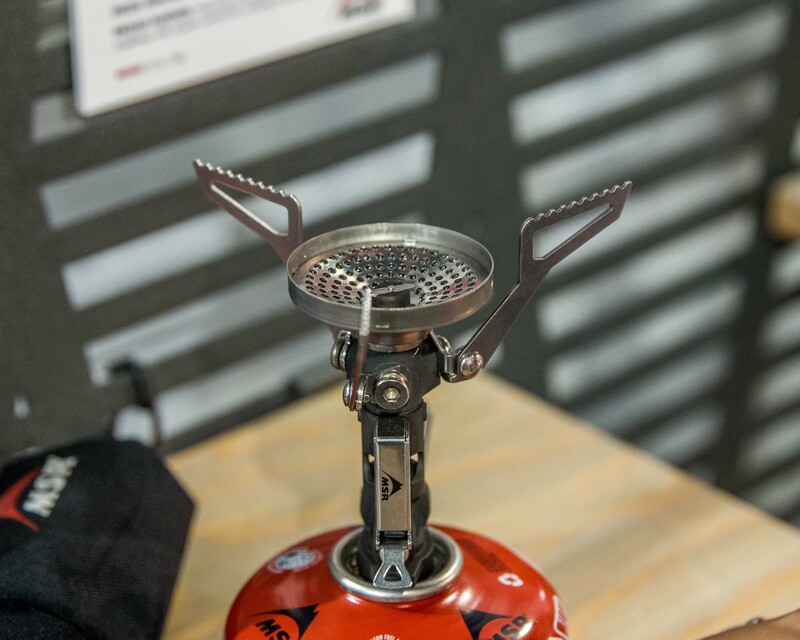 The larger burner improves wind resistance and simmer control. Of course when you add features the weight goes up but surprisingly the Deluxe only weighs 83g, 10g more than the Pocket Rocket 2. For perspective that’s about the same as a Cliff Bar! The MSRP will be $70 USD. 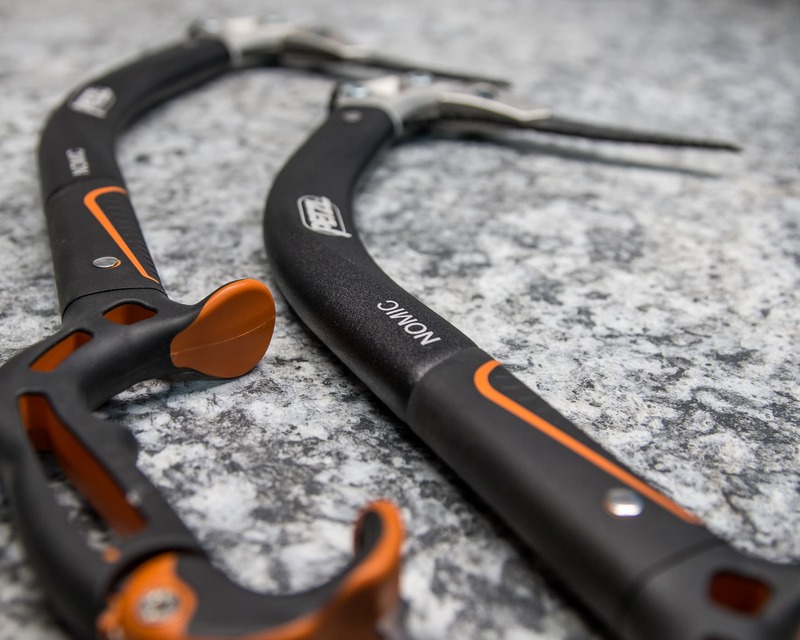 SMC is expanding their mountaineering axe selection with the introduction of the new Kobah line. 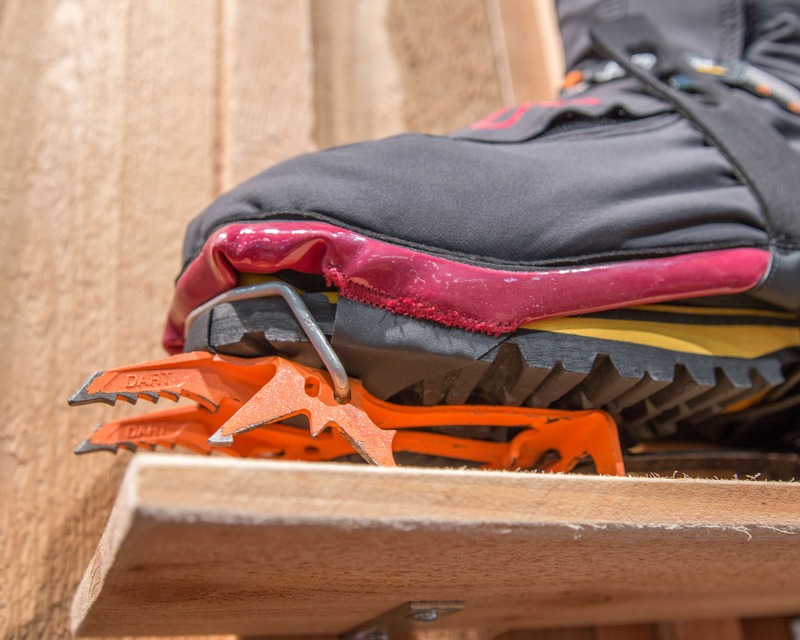 The Kobah Speed is a minimalist lightweight option that’s ideal for ski mountaineers and summer alpine trips with minimal ice/snow climbing. On the other hand the Kobah Pro is a more technical tool. The Kobah speed comes in 45 and 50cm lengths, has a chormoly pick and the aluminum shaft is cut at an angle to create a lightweight spike. 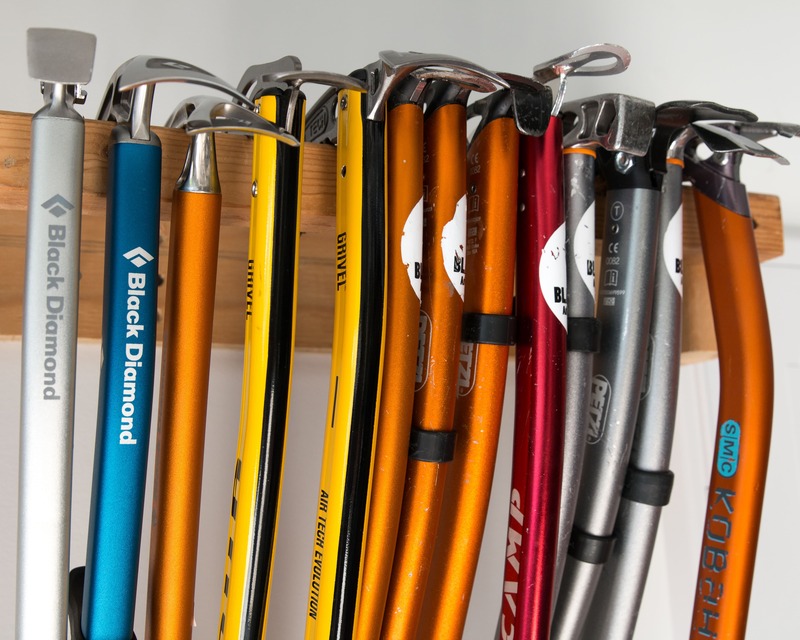 Weighing in at 340g and 355g for the 45 and 50cm lengths respectively it’s not nearly as lightweight at the Petzl Ride (240g for a 45cm axe) or the Corsa Nanotech (246g for a 50cm axe) though. It’s also a little pricey with an MSRP of $120 USD. The Kobah Pro has a simple and elegant design with a bent shaft, movable grip (GripLock) and a modular head that can accommodate either an adze or hammer. It comes in 50, 57 and 65cm lengths and weighs in at 474, 502 & 533g respectively (adze option). Just slightly heavier than the Petzl Sum’tec at 470g for a 55cm axe but lighter than BD’s Venom axes. 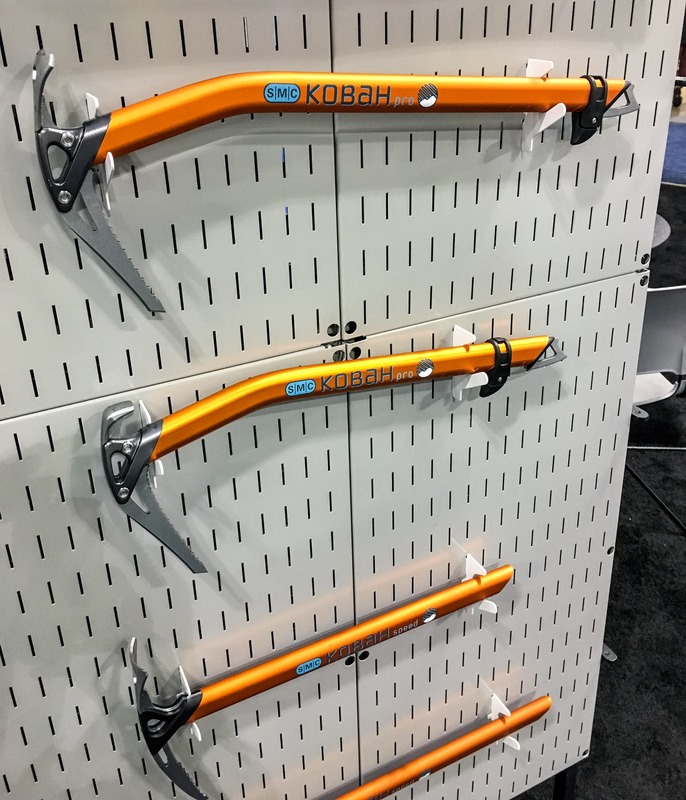 The Kobah Pro will retail for $190 USD and looks to be a solid mountaineering tool. 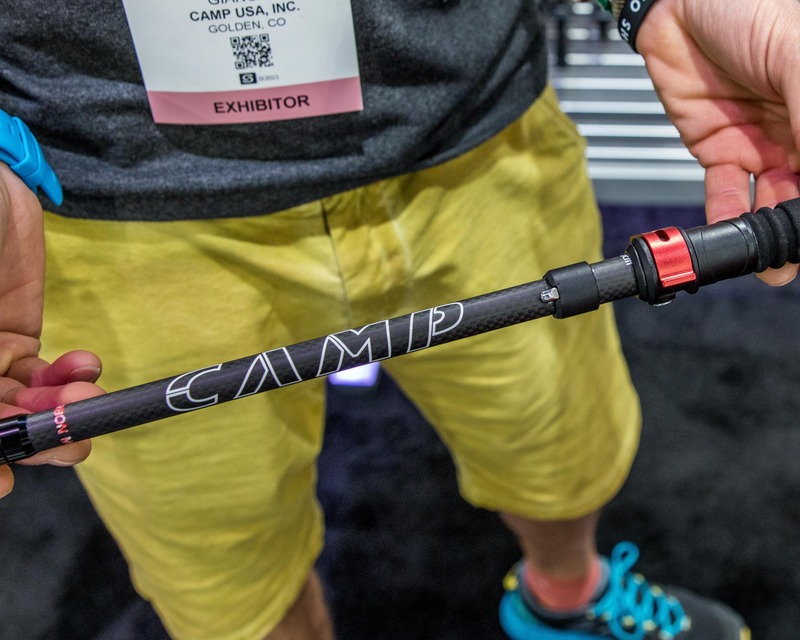 Camp introduced 7 new lightweight collapsible trekking/trail running/ski touring poles at the show. 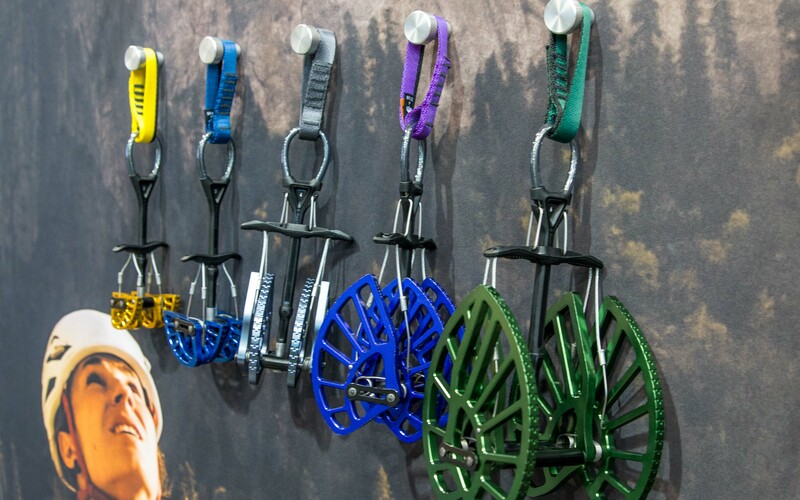 Of course I’m not going to cover them all but rather focus on 2 of particular interest to climbers and mountaineers: the Sky Carbon Evo and the Carbon Mix. 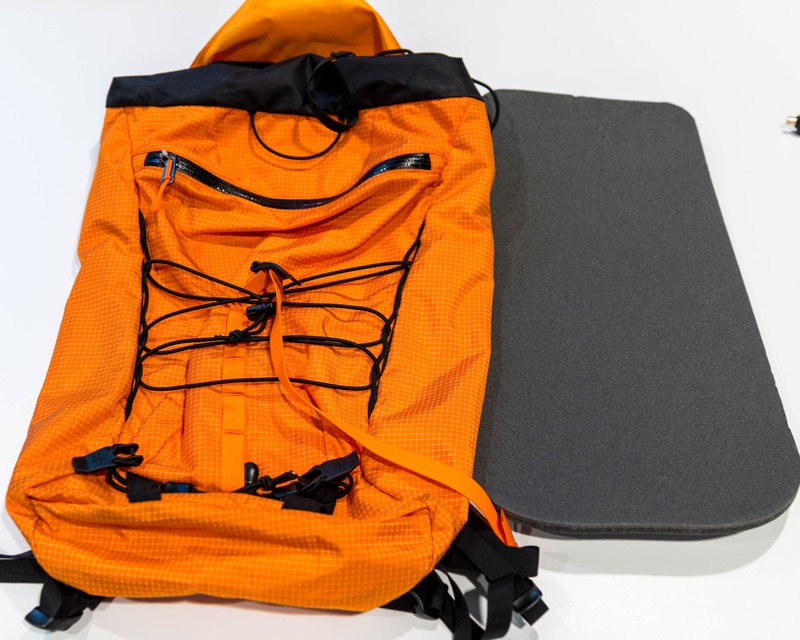 Both are variable length, lightweight poles that can be collapsed in a Z-shape to 36cm and stuffed in a pack when not in use. 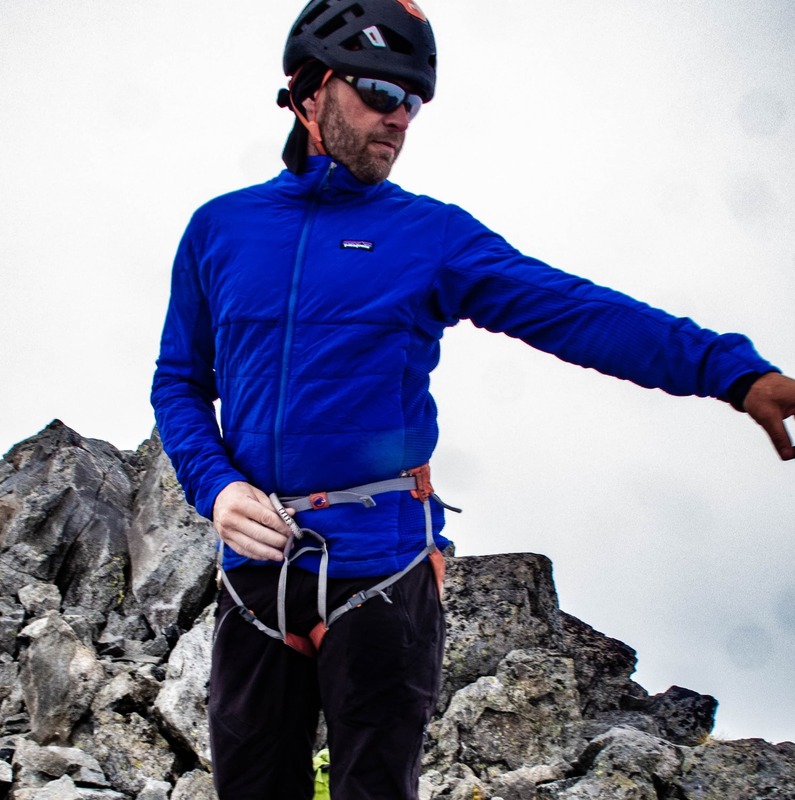 Perfect for summer and winter climbing approaches as well as ski touring. 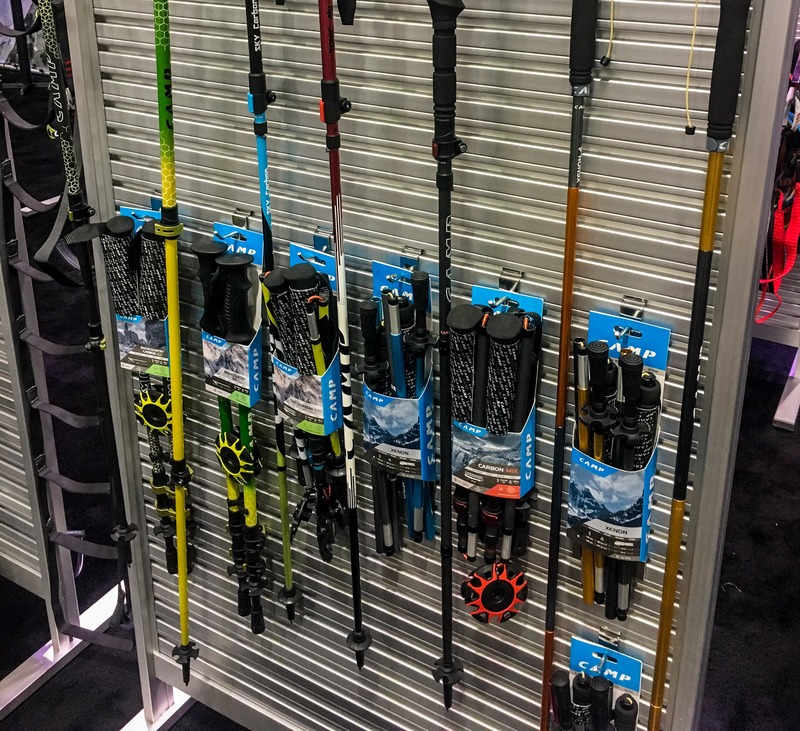 The Sky Carbon Evo poles use carbon fiber on the upper segments and aluminum alloy on the bottom segment and joints for a balance of weight, rigidity and strength. 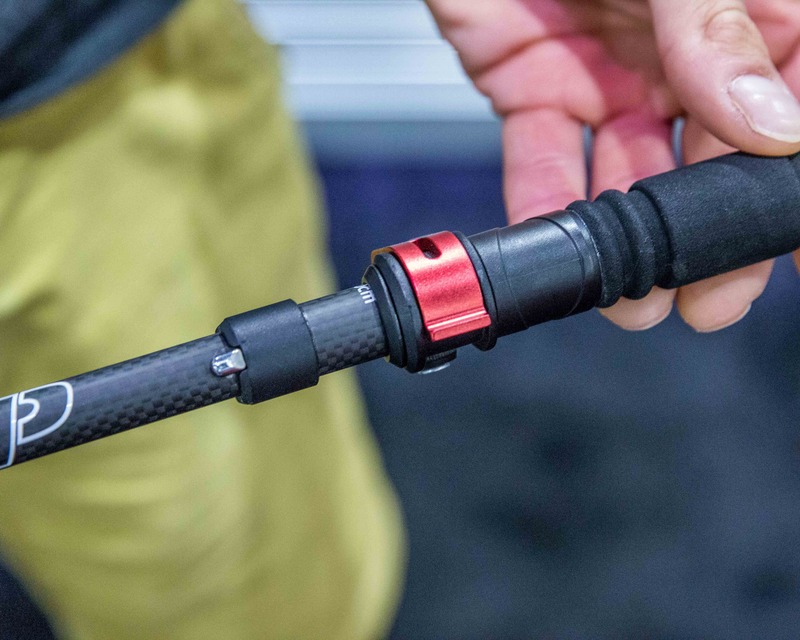 I’ve personally had issues with the carbon splitting around the metal locking tab on some BD poles so really like the idea of a little aluminum in that area. 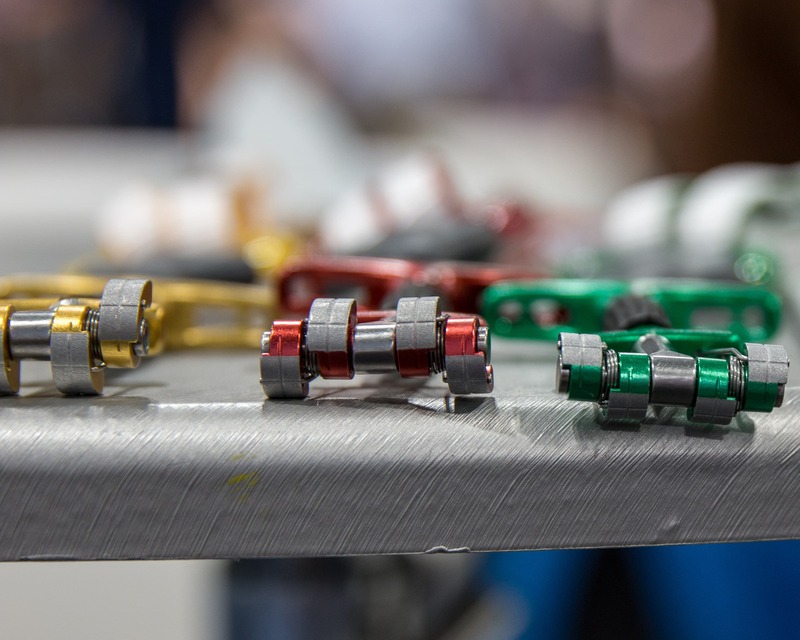 The Sky Carbon Evo’s have a length adjustment range from 115cm to 135cm so favor average to taller people. Other features include both summer and winter powder baskets, carbide tips and soft foam grips. Weighing in at 400g they’re about 100g lighter than the competition. MSRP will be $180 USD. 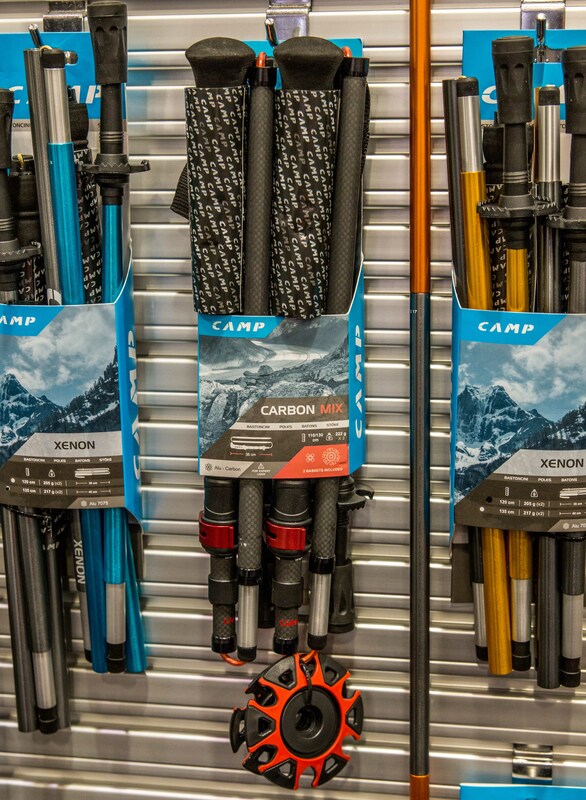 The Carbon Mix poles are constructed of carbon fiber with aluminum alloy joints for increased strength and rigidity. They also have longer handles that making a choked up grip more comfortable. 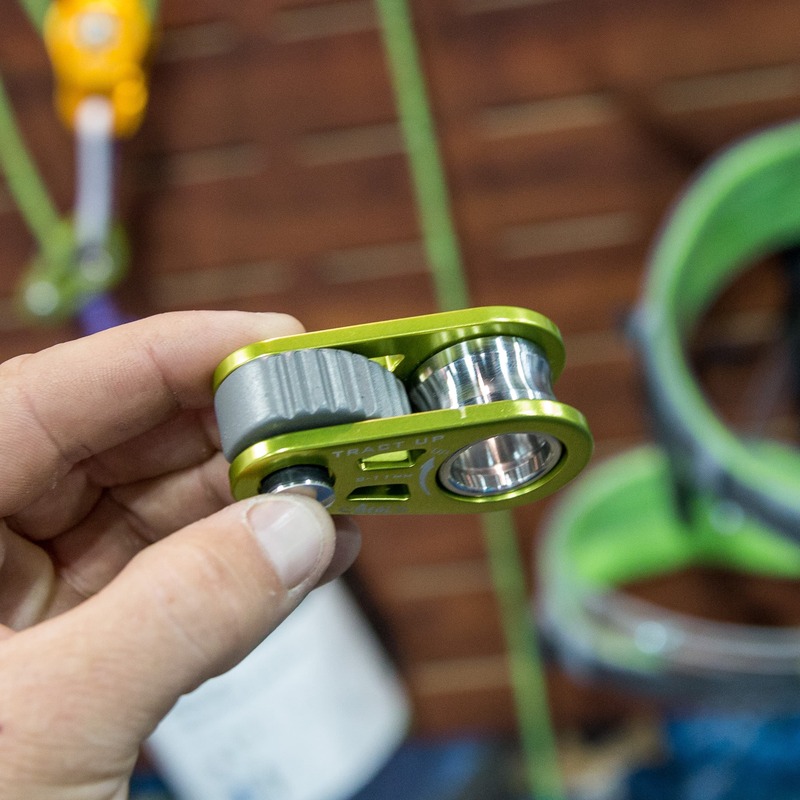 A great feature for ski touring or trekking in technical terrain. They have a length adjustment range of 110cm to 130cm, a good zone for most people and come with both summer and winter baskets. Slightly heavier than the Sky Carbon Evo’s they’re still dam light at 444g. The Carbon mix will retail for $200 USD. Well that’s it for the new alpine toys. Blue Ice has a cool new mountaineering axe with a titanium pick that I wasn’t able to get a look at. Luckily Raf over at The Alpine Start did. If you’re interested you can check them out here. Stay tuned for new shelters and then maybe packs!